Every river has it’s personality and the long rivers have their ages, too. By the time the Lot reaches St. Cirq Lapopie it’s already middle aged, looping serenely in sinuous meanders, re-oxygenating every two or three kilometers in a mad scramble over weirs. The pebbles and boulders that it’s rolled down from the Massif Central over tens of thousands of years have cut vertically through the limestone leaving towering cliffs that glow like calligraphic characters against the green slopes. The current is so slow you can swim against it. Rushes and sedges and clumps of purple loosestrife grow at the water’s edge. Majestic black poplars tower above and cantilevered alders stretch over the water. Ribbons of pink alluvial soil intersperse with fields of corn or sunflowers or tobacco and stone barns and farm-houses with red tiled roofs. This landscape is ceaselessly changing, and the changes are doubled in the reflections. Sometimes, when it’s rained hard up river in the Cantal, the river runs red with sediment and for a day or two you find yourself in a psychedelic world of reds and greens with purple shadows. A breeze you hear whispering in the aspen grove will turn alder leaves so that they shimmer like mercury. Ruffling the surface of the water it effaces the upside-down world and replaces it with a flat plane of liquid silver that reaches across to the opposite bank. And all the time the slow spin of the earth lengthens shadows and extinguishes trees that moments before had been incandescent in sunshine. These few miles of quiet river in south-west France irrigate my life as a painter. 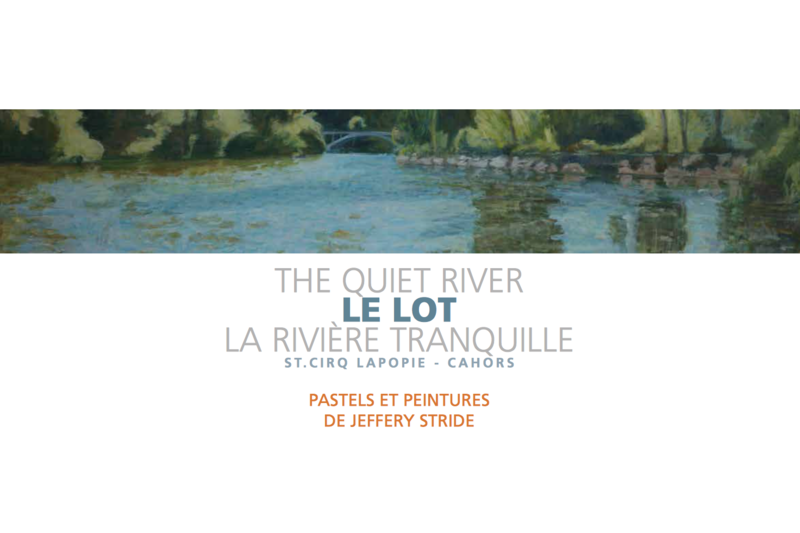 You may also purchase the book “The quiet river” 25€ – £20, including shipping cost.Payment can be made by cheque, PayPal or direct debit (£ ou €).